1. Material: 100% polyester + imported cooling fiber. 2. Gently wringing the wet towel out and shaking several times, only few seconds become cool(15 degree bellow outdoor temperature). 3. Single layer fabric, light weight, refreshing. 4. 98% UV blocking rate, 30+ UV protection index. 5. Chemical-free, physical cooling effect. 6. Normal temperature water even 90 degree hot water, and sweat can generate cooling effect just in few seconds. 7. Machine washable. 8. Works great for sports, outdoor activities and hot environment works. 9. Do not bleach the towel, it may damage the fabric. 10. Do not leave the towel in high temperature/high humidity for a long time. 11. The edge of the towel my become loose and curl after long washing or use. 12. 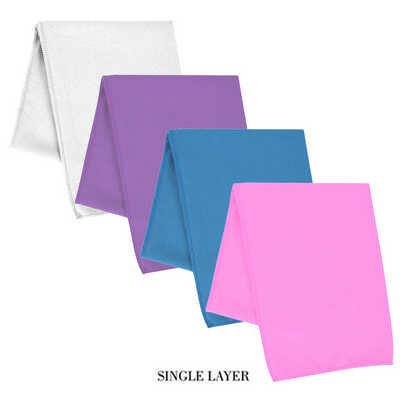 Do not fold when it is hard, simply wet it to soften. 13. Do not put it in dryer. Item Size: 300 mm x 900 mm. Package: plastic bag + instruction sheet. Colour Range: white, blue, purple, pink. Price includes : 7 Days 1c/1p printed. Setup is not included, please ask for a final price from your sales representative.